This Roman Stove makes an excellent camp item. Examples were found in the ruins of Pompeii. The Roman Stove is constructed from riveted and welded plates of blackened steel; sturdily crafted, it is ready to be used to create your meal at your Roman encampment. 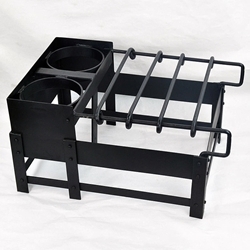 The stove features two integrated round pot holders and four moveable grill bars.